The Stealth Bomber is an aircraft used by the American military. Its unique quality is that it can elude enemy defences because it is exceptionally difficult to track. It literally avoids radar detection. The Toronto Argonauts have a stealth-like weapon at their disposal and he wears number 10. 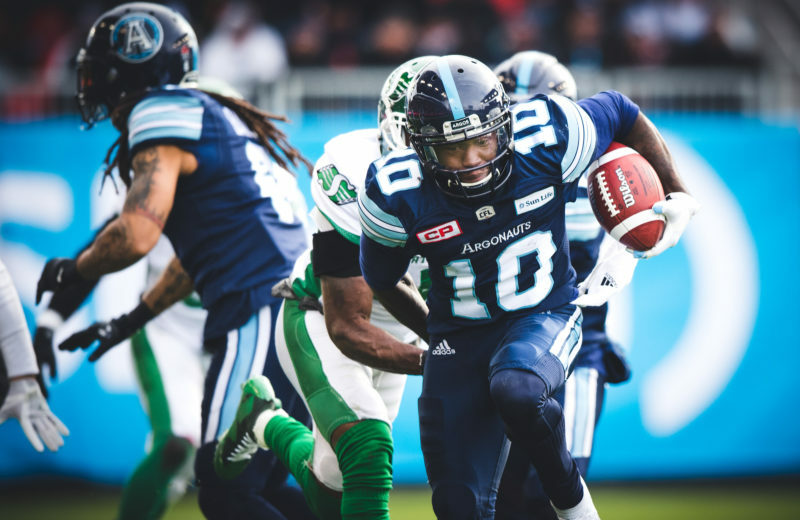 Armanti Edwards was acquired by the Argos on the eve of the 2017 training camp, acquired from Saskatchewan in a one-for-one trade for offensive lineman Peter Dyakowski. Argo General Manager Jim Popp finally landed the receiver he had coveted for some time. Popp first placed Edwards on his negotiation list while he was running the Montreal Alouettes. Popp is able to laugh about it now, only because he was able to acquire Edwards and his combination of talent and quiet leadership. The move from Toronto to Regina was a relatively easy one for the player. The move inside from wideout to the slot fit Edwards like a glove. With S.J. Green, Ricky Ray and James Wilder Jr. attracting most of the attention, Edwards avoided media detection and finished the season with 83 receptions, falling an intermediate route shy of 1,000 yards. But it is one specific grab that will not be forgotten, even though it was overshadowed by a teammate’s catch on the same drive. In the East Final against Saskatchewan, the Argos trailed the Riders by three points late in the fourth quarter. On a third-and-five Ray hit Wilder on a wheel route, extending the drive and moving the Argos into field goal range at the Saskatchewan 18. The next play Ray threw in the direction of Edwards, but it fell incomplete. On second-and-10 Ray looked over the defence and loved what he saw in his pre-snap read. He audibled at the line of scrimmage, then dropped back again. Edwards ran straight down the left seam, Green straight down the right. Both were running curl routes, turning back to the ball just before the goal line. Safety Mike Edem was in the end zone an equal distance from the two targets. He had to make a decision before the receivers made their move, who was he going to help cover? Ray looked at nobody but the safety. As soon as Edem took a step toward Green, the QB fired the ball in the direction of Edwards. The pass was perfect, and the sticky-fingered receiver showed off his toughness, hanging onto the ball at the one-yard line as four defenders converged on him, trying to knock the pigskin loose. They couldn’t. Two Cody Fajardo quarterback sneaks later the Argos were in the end zone and heading to the Grey Cup final. It was an enormous play, one the receiver recalls fondly as it came in his first playoff appearance as a pro. He hadn’t been in a post-season game since he was a quarterback at Appalachian State, where he was the first two-time winner of the Walter Payton Award as the Outstanding Player in the NCAA’s FCS. Much like the Stealth, the soft-spoken Edwards can be difficult to detect away from the field. That doesn’t mean the Greenwood, South Carolina native doesn’t share the receiving corps leadership responsibilities with S.J. Green. 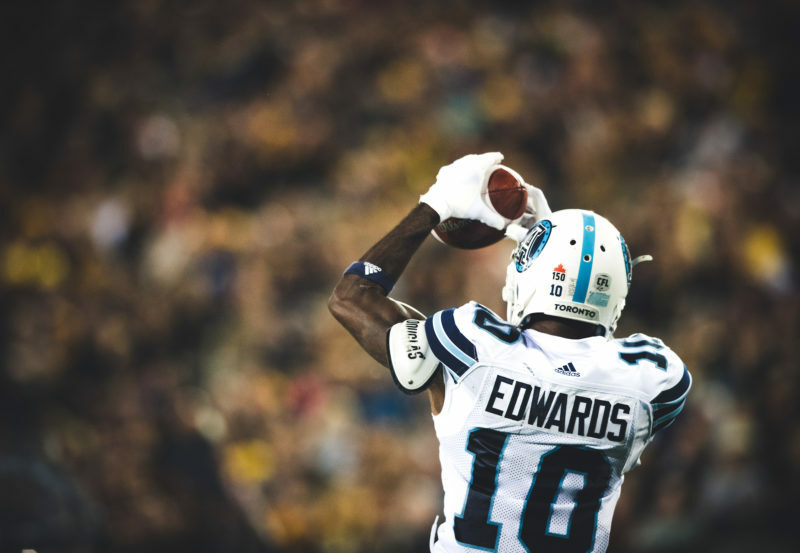 Argonauts.ca asked Green what Edwards brings to the offence. Surprisingly, he’s only been targeted three times in the first half of games this season, but has become a favourite target down the stretch. Eight of his ten catches have come in the fourth quarter, and he also hauled in a two-point conversion after Declan Cross’ game-winning TD against Edmonton. Edwards likes his situation in Toronto, both on and off the field. There’s also a lot for the Argos to do as they endeavour to return to their championship form of 2017. The flight to their preferred destination will be much easier with the continued production of their stealth receiver.